Taenia solium is the aetiological agent of human taeniasis, pig cysticercosis and human neurocysticercosis, which are serious public health problems, especially in developing countries. 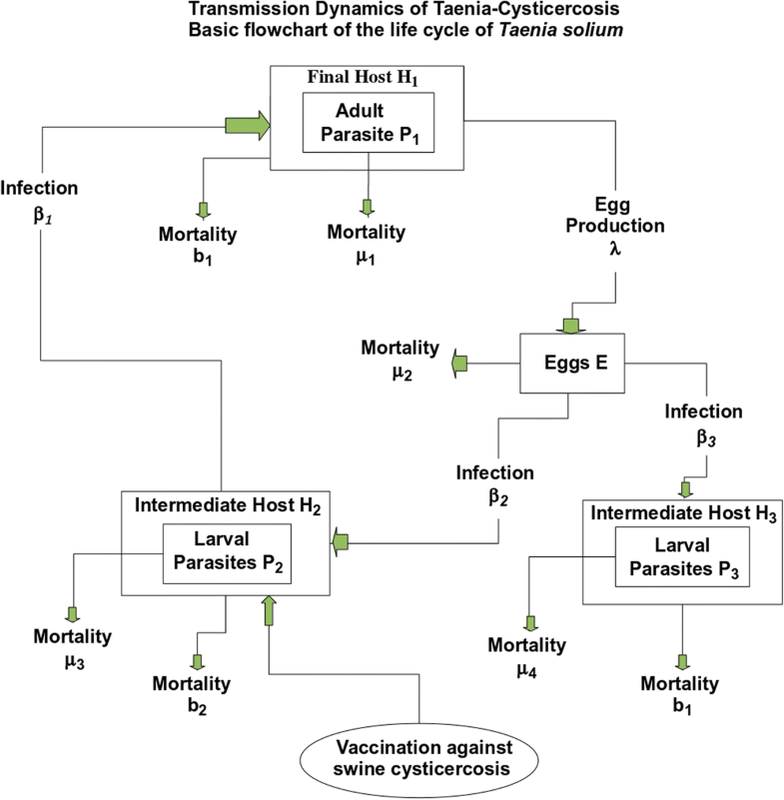 A mathematical model of the transmission dynamics of taeniasis-cysticercosis is formulated. The model consists of a coupled system of differential equations, which are density-dependent equations for describing the flow of the parasite through the life cycle. The model is hybrid since it comprises deterministic equations with stochastic elements which describe changes in the mean parasite burden and incorporates the overall pattern of the parasites’ distribution. Sensitivity and bifurcation analyses were carried out to determine the range of values of the model. The model can reproduce the observed epidemiological patterns of human taeniasis, pig and human cysticercosis. 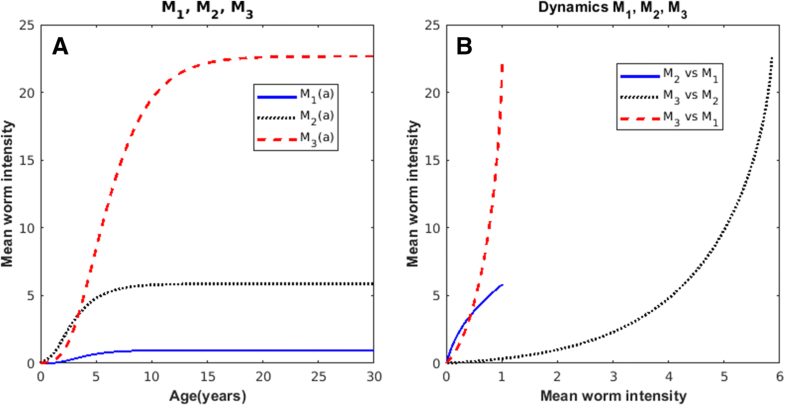 For example, for a wide range of parameter values, the mean intensity of adult worms tends to rapidly stabilize in one parasite per individual host. From this model, we also derived a Susceptible-Infected model to describe the prevalence of infection in humans and pigs. Chemotherapeutic interventions against pig cysticercosis or human taeniasis may reduce rapidly and effectively the mean intensity of human taeniasis, pig cysticercosis and human cysticercosis. This effect can be achieved even if the protective efficacy of the drug is of the order of 90% and the coverage rate is 90%. This means that health in humans infected either with adult worms or cysticerci may be achieved by the application of anthelmintic drugs against pig cysticercosis. However, treatment against human cysticercosis alone, does not influence neither human teniasis nor pig cysticercosis. This is because human cysticercosis infection does not influence the value of the basic reproductive number (Ro). Even coverage of 100% in the administration of anthelmintics did not eliminate the infection. Then elimination of the infection in all hosts does not seem a feasible goal to achieve by administering only chemotherapeutic interventions. Throughout the manuscript a discussion of our model in the context of other models of taeniasis-cysticercosis is presented. Taenia solium cysticercosis constitutes a serious public health problem, especially in developing countries where pigs are raised in rural communities. In developed countries taeniasis-cysticercosis was practically eliminated since the beginning of the twentieth century. It has, however, reappeared in recent years because immigration of a considerable number of people from developing countries who may be carriers of T. solium and because of increased world-wide tourism [1–11]. In countries in which this parasitosis remains endemic, cysticercosis may affect 2 to 4% of the general population [7, 10]. It is a source of important economic loss in pig rearing in the Third World . In humans, T. solium frequently causes neurocysticercosis (NC) which is one of the main causes of epilepsy in the world . It has been found that 29% of epilepsy in endemic communities are attributable to NC , which in some communities affect more than 1% of the population. By conservative estimates, greater than 5 million cases of epilepsy worldwide, which are all preventable, are caused by NC . NC is one of the most frequent parasite infections associated with neurological chronic morbidity in the United States . Human NC evolution is highly variable from complete latency to severe encephalopathy with psychomotor regression. The most frequent invalidating symptoms include seizures, headache, vomiting, endocranial hypertension, confusion, focal pyramidal deficits, cranial nerve dysfunction, cerebellar syndrome, amaurosis (vision loss or weakness) and dementia. It is also a main cause of late onset-epilepsy, accounting for more than 50% of such cases and approximately 30% of all patients develop hydrocephalus secondary to obstruction of cerebroespinal fluid circulation . Pediatric cases of neurocysticercosis have been increasingly diagnosed in the US and other countries [6, 11, 14, 16]. A retrospective series of 47 pediatric cases of NC were reported in a children hospital in Chicago where NC is a relatively common cause of febrile seizures in children who require emergency attention . The high frequency and seriousness of NC justifies the efforts to prevent it. Transmission of the disease was described over a century ago and is clearly related with rustic rearing of pigs in impoverished sectors of the rural population. There is evidence that rustically reared pigs become infected within the first days after birth . The requirement of the pig as an obligatory intermediate host for the maintenance of the T. solium life cycle may allow the interference with transmission by modifying pig exposure to cysticercosis. This possibility is of importance considering that in most cases, pigs live no more than a year. Since pig is an indispensable intermediate host, transmission could be reduced by lowering the prevalence of pig cysticercosis through effective mass chemotherapy and/or vaccination. However, application of control measures demands the identification of high prevalence areas and, the availability of reliable, sensitive and, specific diagnostic procedures . More recently, TSOL18 vaccine has proven to be the most effective vaccine against T. solium, with independent experimental vaccine trials carried out in Mexico, Peru, Cameroon and Honduras inducing 99.3–100% protection against an experimental challenge infection with T. solium eggs in pigs [19–23]. Numerous mathematical models have been elaborated about the transmission dynamics of several infectious diseases produced by helminths [24–31]. Several mathematical models of cestode infections such as E. granulosus, Taenia hydatigena and Taenia ovis in sheep and dogs have been developed [32–34]. Considerable advances have been made in breaking the “epidemiological code” of the family taeniidae with the aid of mathematical modelling. This family contains such zoonotic parasites as Echinococcus granulosus, Echinococcus multilocularis, Taenia solium and Taenia saginata. A preliminary model for the dynamics of cestode infections was proposed by Keymer . This model described the dynamics of the larval, adult and egg populations for several tapeworm species. The model was analysed and shown to obey a threshold criterion: when a combination of parameters called the basic reproductive number, usually denoted by Ro, exceeded 1, the model suggested that the parasite population would, over time, reach a stable equilibrium level. When the basic reproductive number was lower than the needed value for the maintenance of the parasite population, it became extinct over time. Keymer and Anderson  used a model to describe the dynamics of the rat tapeworm Hymenolepis diminuta, which may infect man through accidental ingestion of the intermediate host, beetles of the Tribolium species. They suggested that similar models could be used to describe the dynamics of parasites such as Echinococcus granulosus and Diphyllobotrium latum. Much of the current theory of helminth infections is based on the pioneering work of Kostitsyne , who formulated a deterministic model consisting of an infinite series of differential equations describing changes in the densities of hosts harbouring any specified number of parasites. The major contribution of this early study was the recognition that the classical epidemic models [37–40] were inappropriate descriptions of the dynamics of helminth parasites. Models of helminth transmission must take account of the fact that the pathology induced by parasitic infection, the fecundity, mortality and establishment of the parasites, and the host responses generated by infection all typically depend on the number or burden of parasites harboured by the host. However, Susceptible-Infected-Recovered/Immune (SIR/I) models, suitable for microparasitic infections (i.e. bacteria, viruses and protozoa), have been formulated to capture the transmission dynamics of the macroparasite T. solium [41–43]. The SIR/I model ignores the life cycle of the helminth parasite. It is assumed that all individuals are in contact with one another randomly. 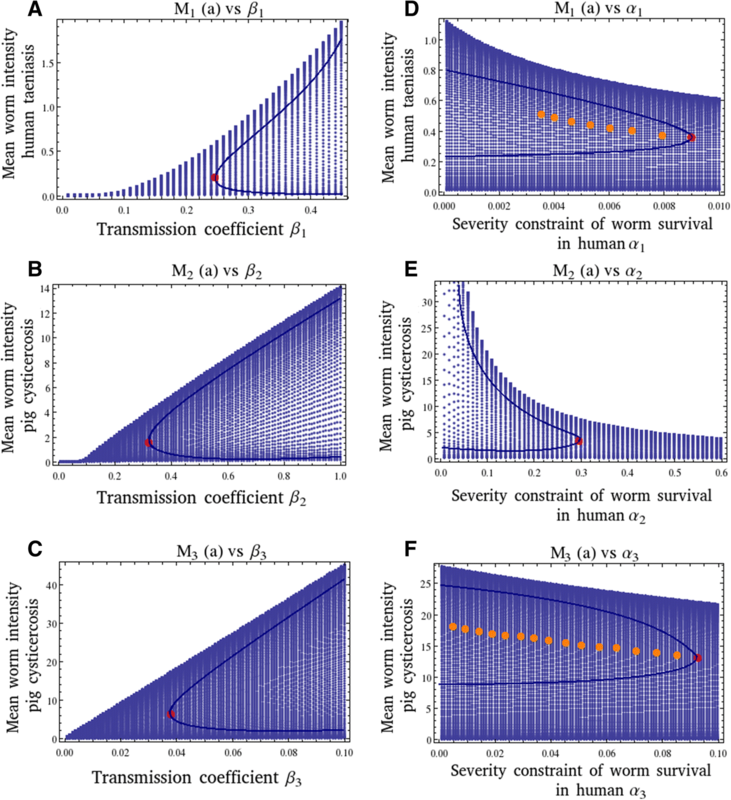 Explicitly, these models assume that the number of infected individuals is equal to the number of susceptibles hosts times the probability of escaping infection due to a contact with one infected individual [41–43]. Kyvsgaard et al. , Winskill et al. , and Braae et al. assumed in their equations that the rate of transmission (β) obeys the mass action principle, i.e. the rate of transmission is proportional to the product of the density of susceptible X times the density of infected individuals Y (βXY). The symmetry of the mass action incidence theoretically allows that susceptible individuals can transmit susceptibility . When this happens, the infections have a SIS-type spread in human populations. For microparasitic infections, the basic reproductive number, Ro, is defined as the average number of secondary infections produced when one infected individual is introduced into a host population where everyone is susceptible. The question of how to measure the number of new infected individuals in the case of persistent helminth infections in which the hosts (definitive and intermediate) are continually re-infected cannot be addressed by SIR models. SIR models do not consider reinfections and the fact that the distribution of most helminth infections is overdispersed (the variance greatly exceeds the mean) [45, 46]. The negative binomial distribution has been found to provide a good empirical description of the distribution of most helminth parasites [47–49]. For many deterministic epidemiology models, an infection can get started in a fully susceptible population if and only if Ro > 1, thus the basic reproduction number Ro is considered as the threshold quantity that determines when an infection can invade and persist in a new host population. Helminth infections, in contrast, are typically endemic and Ro is defined as the average number of female offspring (in the case of a dioecious species) produced throughout the expected lifespan of a reproductively mature female parasite (which attains reproductive maturity in the absence of density-dependent constraints on population growth). T. solium is hermaphrodite and its mating probability is therefore equal to 1 [26–29]. In this work, we develop, for the first time, a density-dependent model for the transmission dynamics of taeniasis-cysticercosis. The model captures the flow of the parasite throughout its life cycle. It explicitly considers the overdispersed distribution of the parasite in both pigs and humans. It is expressed in terms of the mean worm intensity and prevalence of infection. This model will permit to realistically interrogate the transmission dynamics of the taeniasis-cysticercosis and to understand the effects of chemotherapeutic and vaccination interventions. The article is being published in two parts. The first part is organized as follows. We present and analyse the empirical evidence of the epidemiology of taeniasis-cysticercosis together with a detailed description of the life cycle. Second, we present a derivation of the mathematical model of the transmission dynamics of the life cycle of taeniasis-cysticercosis. The dynamical properties of this model are examined and bifurcation analyses of some of its parameters are presented. Third, computer simulation experiments (CSE) of this model are carried out to answer several questions such as the likely impact of different chemotherapeutic strategies aimed to interrupt transmission. Modifications of the density-dependent model lead to a new compartmental model which describes the prevalence of infection in pigs and humans. This Susceptible-Infected (SI) model, permits to interrogate the actual transmission dynamics of the taeniasis-cysticercosis and to understand the effects of chemotherapeutic or vaccination interventions. With the density-dependent model, we present different drug interventions against pig cysticercosis, whilst with the compartmental model we simulate chemotherapeutic interventions against human taeniasis. We explore different rates of coverage and different rates of efficacies for the corresponding anthelmintic. The second part of this article deals with the extension of the SI model to evaluate both chemotherapeutic and vaccination interventions. Finally, the results are discussed in terms of the mathematical theory of infectious diseases and in terms of different chemotherapeutic interventions that can be routinely implemented against either swine cysticercosis and/or human taeniasis. T. solium, the pork tapeworm, is a cestode that inhabits the intestinal lumen of humans. Humans are the only known definitive host of T. solium. The life cycle of T. solium includes a larval phase (cysticercus) which affects both the human being and the pig (intermediate host). NC develops when the cysticerci infect the nervous system. Taeniasis, i.e., general infection with T. solium, is acquired when humans ingest undercooked pork that is infected viable cysticerci. After the cysticercus is ingested, the larva evaginates from the cyst and anchor in the intestinal wall and develops into a sexually mature adult worm. Each day a few mature proglottides are detached from the distal end of the mature worm, reaching the environment mixed into the faecal material. Each gravid proglottide contains around 60,000 eggs . In areas with deficient sanitation, eggs may contaminate vegetables and food. When humans and pigs ingest these eggs, cysticercosis will develop, thus completing the life cycle of the parasite (see Fig. 1). If the parameter k tends to infinity the frequency distribution of parasites collapses to a Poisson distribution and helminth parasites are independently randomly distributed. As k tends to zero the worms are severely aggregated. Equation (1) is illustrated in Fig. 2 when M is equal to 1. 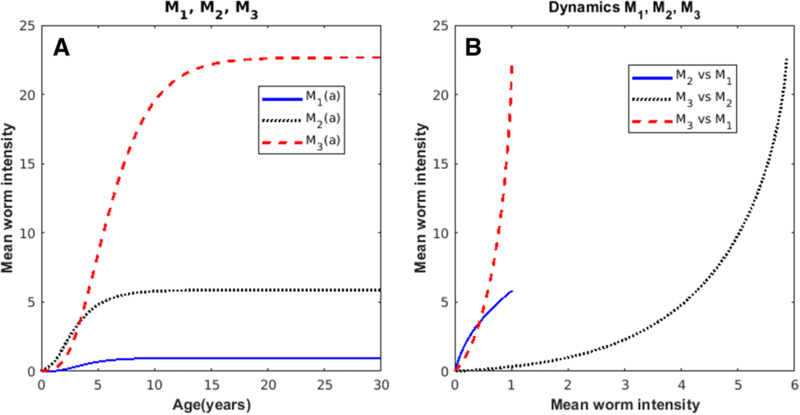 Given the constraint of one adult worm per individual there should be only one hyperbolic curve along which the relationship among prevalence of infection, mean intensity and the degree of aggregation can be uniquely described. The hyperbolic pattern means that when human hosts eat infected pork meat, they are sampling larvae from an overdispersed distribution. Since the mean worm intensity starts from values close to zero and increase rapidly to 1, then there is a period in which individuals with several larvae reflect the overdispersed distribution until, in average, each infected individual harbour one adult parasite. It has been observed that mean prevalence increases with age until the 30–39-year age group and declined thereafter . Note that when the value of k is very large the theoretical prevalence of the infection is at most 60% when M = 1 in the 100% of the cases. When M is greater than 1, in at least a small percentage (say 7–14%) of the cases, the prevalence of the infection may approach rapidly to 100% (not shown). This is consistent with the observation that very few individuals with taeniasis are found even in endemic regions with cysticercosis. 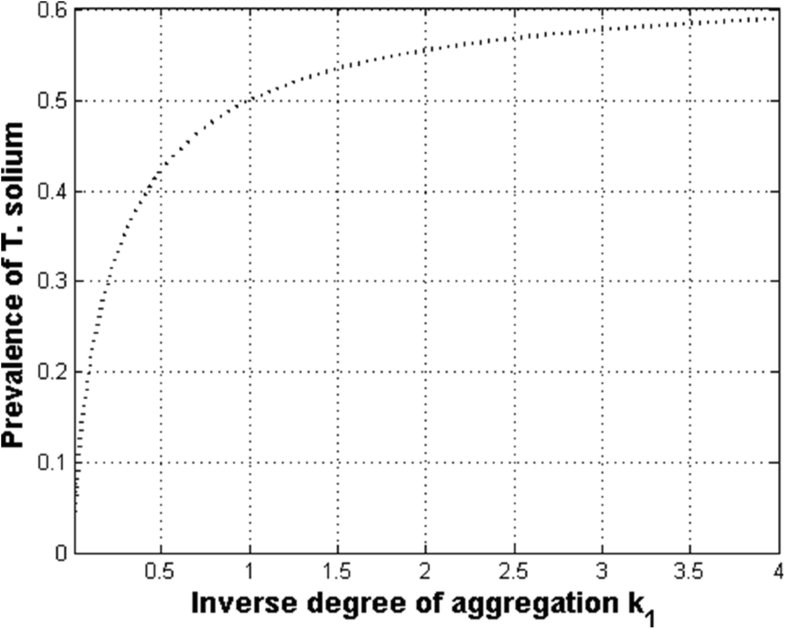 Since typical values of the prevalence of infection of taeniasis are at most of the order of 1 to 3% then, the degree of aggregation should be of the order of 0.02 or less and at most of the order of 0.2 (see the value of k1 in Table 1). The great difficulty in finding adult worms, even in places of very high prevalence of pig cysticercosis (5 to 20%), is undoubtedly a very common and one of the most intriguing experiences in the field. In the case of cestodes the negative binomial has been useful to describe the distribution of H. diminuta in the intermediate host in both laboratory and field populations [35, 60]. In addition, the negative binomial can also be used to describe the distribution of adult tapeworms in the definitive host (e.g. Caryophyllaeus laticeps in the bream, Abrams brama) and also larval tapeworms in the second intermediate host (e.g. Schistocephalus solidus in the stickleback Gasterosteus acuelatus . Frequency distributions of cysticerci in loin, intercostal, leg, shoulder, tongue, diaphragm, and masseter muscle of 41 experimentally infected pigs have been reported . All the estimated values of the parameter k2 (see Table 1) fell in the range of 0.23–0.37 indicating a high and a similar degree of cysticercus aggregation, i.e., most of the pigs harbour few parasites as opposed to few pigs with most of the parasites, regardless of the location of the parasite. The degree of aggregation of cysticerci in the population of pigs therefore can be estimated either by sampling a specific part of the pig or by sampling the whole pig . To elaborate the mathematical model, three distinct developmental stages should be considered: the adult worm in the definitive host, the free-living parasite egg and, the larval worm in the intermediate host. where μ3 is the rate of mortality of larval parasites during the prepatent period and, b2 is the rate of loss of larval parasites during the prepatent period due to natural host mortalities. where p2(i) represents the probability that an individual host contains i parasites. In the pigs, we can assume that there are detrimental parasite-induced effects on host survival or on host fecundity. In the case of pigs, however, it is unlikely that the pigs would survive long enough in the natural environment for parasite-induced effects to be of significance. where β1 is a coefficient representing the rate of transmission after consumption of infected meat, and p2(i) is the probability that an individual host harbours i parasites. where here and further the term of the sum means evaluating ∑ip(i) at (t − T). Adult tapeworms are often considered to be without serious pathogenic effects on the definitive host [62, 63], and here it is assumed that there is no parasite-induced host mortality. Most cestodes are hermaphrodite and are thought in general to be able to carry out both self- and cross-fertilization. Now, it seems safe to assume that all worms in the definitive host are equally capable of producing eggs, whether present singly or in multiple worm burdens. If the instantaneous per capita rate of egg production, λ1, is constant and independent of worm age or density, then the net rate of egg production is equal to λP1, where P1 is the number of adult parasites. This is in contrast with dioceious helminths such as hookworms and schistosomes, where the production of viable eggs does not occur unless the worms are mated within the host. The mating function in those parasites (i.e. the probability that any given female worm has been mated) has important consequences with respect to the overall dynamics of the host-parasite interaction . In this model of taeniasis-cysticercosis it will be considered that the mating function is equal to unity since the eggs of some cestode species are immediately infective to the intermediate host, i.e., there are no significant time delays in egg maturation . The population of infective eggs is subject to considerable mortality while in the external environment [64, 65]. Assuming that the instantaneous rate of mortality is μ2 per egg per unit time, the net rate of loss is equal to μ2E, where E is the density of infective parasite eggs. Each egg thus has an expected life span of 1/μ2 . Infective eggs are removed from the population because of ingestion of potential intermediate hosts (pigs and humans). The rate of loss is equal to β2H2E + β3H3E (pigs plus humans), where H3 is the density of humans infected with eggs that may develop into cysticerci. Loss of eggs as a result of ingestion by animals unsuitable as intermediate hosts is assumed to be incorporated into the term denoting egg mortality (μ2). The 3 loss terms represent deaths due to natural mortalities (μ2E), losses due to infection of pigs (β2H2E), and losses due to infection of humans (β3H3E). where 〈i2〉 is the second moment of the negative binomial distribution p(i), and the parameter k is the clumping parameter. In common with many other parasitic organisms, the expected life spans of the majority of mature and larval tapeworms are many orders of magnitude greater than that of the infective egg. The dynamics of the infective egg population thus operate on a much faster time scale than the dynamics of the other two parasite populations. In addition, the developmental time delays T1, T2, and T3 are generally short in relation to the life span of the hosts and parasites. This suggests that the prepatent time delays are unlikely to be of significance to the dynamics of the parasite population viewed over many generations. An exception to both these generalities is found in the life cycle of E. granulosus . Let’s define the mean worm burden as M = P/H. Since the life span of the parasite egg is much shorter than the several months or years of the survival period of the adult worm, it may be assumed that the dynamics of egg population is effectively at equilibrium when compared with that of the host and larval and adult parasite population. This means that Eq. (2c) is equalled to zero. Since age-chemotherapeutic schedules will be examined later then the dynamics will be finally expressed in terms of age. For the sake of simplicity, we are not yet considering the time-dependent behavior of the dynamics. There are other models of helminth infections that include both age and time [66, 67]. The age-time partial differential version of our model is an ongoing work in our group. Additionally, the available population data of helminth infections is typically given in terms of age-intensity and age-prevalence curves [25, 26, 29]. where μ4 and b1 represent losses of larval parasites during the prepatent period due to natural parasite mortality and natural host mortality, respectively. The net rate of gain to the population of infective larval parasites is β3D3H3E(t − T3). It is assumed that larval parasites have a constant per capita instantaneous mortality rate, μ4, independent of either their density or age. In a population of P3, larval parasites, the net loss of parasites is μ4P3. If we consider a natural larval parasite mortality we can assume that this mortality will depend upon the density of larval parasites within individual hosts. Survival and fecundity may be density dependent. where P3(i) represents the probability that an individual host contains i parasites. The intermediate human host survives long enough for parasite-induced effects to be of significance mainly in terms of morbidity and mortality. Ingestion of humans by humans does not exist (or at least cannibalism is not presently a standard route of transmission). Transmission of cysticercosis or taeniasis by host-to-host contact, do not occur, as it has been assumed in other models [41–43]. In summary, Eqs. (4a), (4b), and (4c) represent a mathematical model of the transmission dynamics of cysticercosis which is a coupled system of three non-linear ordinary differential equations. The stability analysis of the model is presented in Additional file 1. In Table 1 the ranges of values of 24 parameters of the model are shown. The meanings and units of variables and parameters are enlisted in Table 2. The ranges of values of 11 parameters are taken from the literature [18, 52, 58–65, 68] and the ranges of 5 are derived in this paper (k1, D1, D2, D3, T3). The values of the demographic parameters b1 and b2 are typical of rural communities. Then we have 3 transmission coefficients (β1, β2, β3) and 3 density-dependent constraints (α1, α2, α3) for which bifurcation analyses are presented in the next section. For simplicity, we assume that H3 = H1. Gemmel  pointed out that quantitative information regarding the values of several biological parameters were needed to quantify the transmission dynamics of T. solium. With the present sensitivity analysis and the bifurcation diagrams, we have uncovered the ranges of all parameters of the life cycle. This is particularly relevant for the values assigned to the transmission coefficients, β1, β2, and β3 which are expressed in terms of year− 1, and the severities of the density-dependent constraints α1, α2, and α3 whose units are given as number of parasite losses per year − 1 per parasite burden. The time units of the prepatent periods (T1, T2, T3) are in terms of year and all the per capita rates of mortality (μ1, μ2, μ3, μ4, b1, b2), are per year − 1; the density units of the hosts (H1, H2, H3) are in terms of the number of individuals per square kilometer; the rate of fecundity (λ) is in terms of the number of eggs per worm per year. In Fig. 3, bifurcation diagrams of the transmission coefficients (β1, β2, β3) and of the severities of the density-dependent constraints (α1, α2, α3), as a function of the mean intensities (M1, M2, M3), are presented. In all Figures, we show the equilibrium worm burden M∗(a) (the same can done with the equilibrium prevalence of infection P∗(a)) as a function of the transmission coefficients β1 (Fig. 3a), β2 (Fig. 3b), β3 (Fig. 3d), and the severities of the density-dependent constraints α1 (Fig. 3d), α2(Fig. 3e), and α3 (Fig. 3f). In all figures, the region of less density of points is the stable region. The enveloping curve shows the dynamic trajectory of M∗(a) following a perturbation from one of the two equilibrium states, M∗(a) endemic infection and M∗(a) = 0 (parasite extinction). In Fig. 3a, b and c, the upper branch is stable and as the parameters decreases, it reaches the unstable breakpoint MB, (marked with a red dot) which divides the upper branch from the lower which is unstable. Below these breakpoints, the transmission threshold Ro, the infection cannot be maintained. In Fig. 3a, b, and c note that there are positive relationships between the transmission coefficients of the infection in each type of host with their respective mean intensities (upper branch). This is particularly evident for values of β1 and β2 greater than 0.1. For values of β1 < 0.06 or β2 < 0.08, the value of Ro becomes less than unity. In Fig. 3a, note that M1 acquires the value of unity when β1 is of the order of 0.32. Therefore, a biological sensible range of values for β1 may lie between 0.1 and 0.36. In Fig. 3b, the value of M2 is not as restricted as M1, and therefore the range of values that β2 can acquire seems to lie between 0.35 and 1 considering the region of less density of points (stability) of the plot. Values of β2 » 1 may lead to superinfection in the pigs. In Fig. 3c, the same reasoning indicates that a likely range of values for β3 may be from very low transmission rates perhaps of the order of 0.036 up to 0.1. In Fig. 3d, e, and f note that there are negative relationships between the magnitudes of the severities in each type of host with their respective mean intensities. In Fig. 3d, there are several enveloping curves, and therefore multiple stable equilibrium points which are so close that are difficult to highlight them all. In Fig. 3e, the upper branch is stable and as the parameter α2 increases, it reaches the unstable breakpoint MB, (marked with a red dot) which divides the upper branch from the lower which is unstable. In Fig. 3f, the dynamics of M∗(a) as a function of α3, display multiple stable equilibria with multiple breakpoints MB (marked with red dots). The rate of decrease of M1 and M3, as their corresponding values of severity increase, seems to be at a smaller pace than the rate of decay between M2 and α2. Considering that M1~1 the range of values for α1 seems to be very small lying between 0.001 and 0.01, and the range of values for α3 may be between 0.001 and 0.1. These results seem to be consistent with the common observation of mild immune responses of the human host against either T. solium or against cysticerci. This in turn, may be associated to a long coexistence between these developmental stages of the parasite within the human host. In contrast, the range of values of α2 seems to be larger (between 0.01 and 0.6) implying that cysticerci may be more sensible to immune responses mounted by pigs against them. In Fig. 4a a computer simulation of the mean worm burden of taenia (Eq. (4a)), of cysticerci in the pig (Eq. (4b)) and, cysticerci in humans (Eq. (4c)) as a function of age considering the range of values of the parameters given in Table 1 are shown. Note that the mean intensity of taenia rapidly reaches a plateau at M1~1. The age-mean intensities of pig and human cysticercosis follow a hyperbolic pattern. In Fig. 4b the phase diagrams of the mean intensities are shown. Note that M2 vs M3 (pig cysticercosis versus human cysticercosis) intersects with M1 vs M2 (human taeniasis versus pig cysticercosis) but not with M1 vs M3 (human taeniasis vs human cysticercosis). The mathematical model presented in the previous sections captures the essential aspects of the transmission dynamics of the infection of taenia-cysticercosis. This model is known in the literature of mathematical epidemiology as a density-dependent model that describes the flow of the parasite throughout the life cycle. Our interest now is to examine what could be the likely impact of the application of chemotherapy administered to pigs or humans upon the dynamics of the infection in pigs and humans. The derivation of the corresponding equations that allow for vaccination are presented in Part II. Effective and safe anthelminthic parasites are available for human taeniasis, pig cysticercosis, and human cystercosis such as praziquantel, niclosamide, albendazol, and oxfendazol [69–75]. The previous model does not allow us to deal explicitly with hosts individuals that are susceptible, immune or vaccinated. The model refers to the worm loads of already infected individuals. Herein we extend the previous model to allow for the evaluation of different community interventions: application of a vaccine against either human taeniasis and/or swine cysticercosis and/or chemotherapeutic interventions against either the taenia and/or the larval cysticerci. It is worthwhile to mention that Ro in this SI model (Eqs. 10–15) is given by Eq. 5. To illustrate accessible chemotherapeutic interventions, we show the results of applying mass chemotherapy only to pigs as follows: from 1.2 to 2.4 months of age, no intervention during 1 month, intervention again but to pigs from 3.6 to 4.8 months, no intervention during 2 months, and intervention to pigs from 7.2 to 8.4 months of age, consecutively (Fig. 5a); The other treatment schedule is the same as that shown in Fig. 5a, but there is no intervention from 8.4 to 10.8 months, and an additional treatment is applied to pigs of 10.8 to 12 months of age (Fig. 5b). In both cases, the rate of increase of the mean worm intensity is always reduced after the application of the drug, but after the treatment ceases, the mean worm burden increases again, and an increasing saw-toothed pattern emerges in both cases. After the treatment ceases the mean worm burden continues to increase as if no treatments had been applied. We also note that the greatest reduction in the mean worm burden is achieved in the second chemotherapeutic regime (Fig. 5b) when the drug is administered to pigs from 10.8 to 12 months of age. The latter coincides with the moment in which the infection starts to stabilize (see Fig. 4). These computer experiments highlight the robustness of the endemicity of pig cysticercosis. 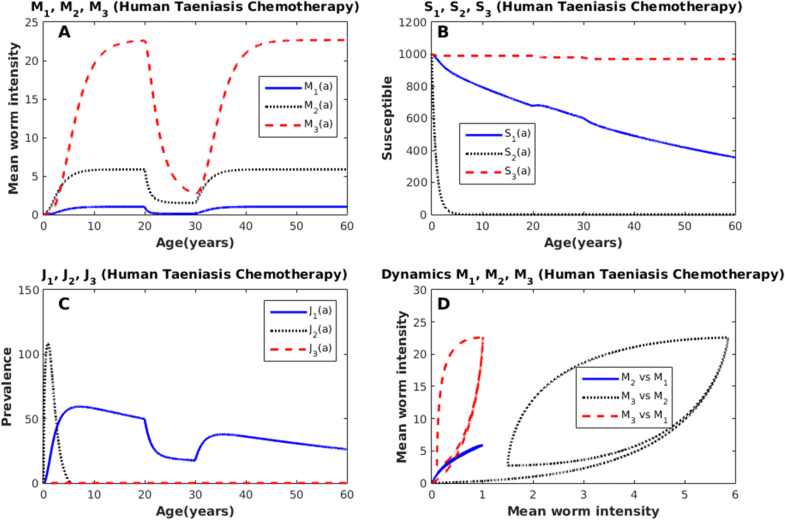 The effect of these chemotherapeutic regimes on human taeniasis and human cysticercosis is simply to delay the rate at which they tend to stabilize their mean worm burdens as a function of age. Computer simulations against human taeniasis with different values of G1 and C1 are found in Additional file 2. 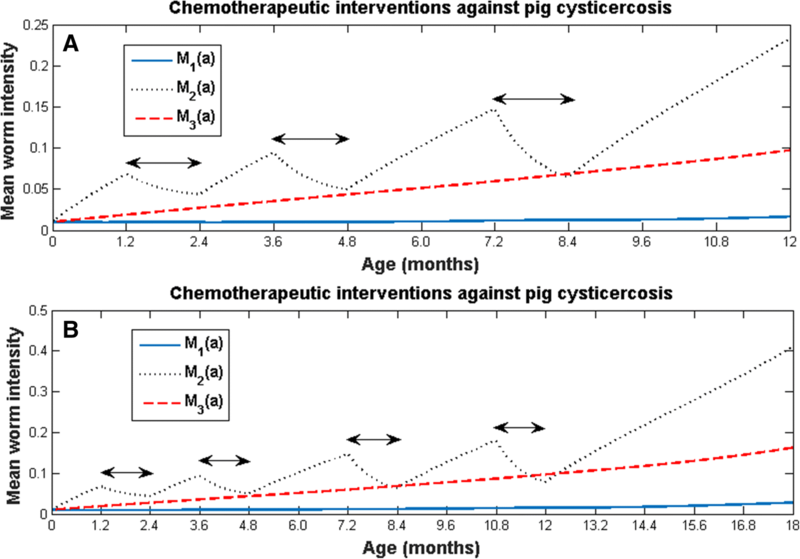 Chemotherapeutic interventions against pig cysticercosis: a from 1.2 to 2.4 months of age (first double arrow), no intervention during 1 month, intervention again but to pigs from 3.6 to 4.8 months (second double arrow), no intervention during 2 months, and intervention to pigs from 7.2 to 8.4 months of age (third double arrow), consecutively; b The treatment schedule is the same as that shown in (a), but after no intervention from 8.4 to 10.8 months, there is an additional treatment to pigs of 10.8 to 12 months of age (fourth double arrow). The values of the parameters are the same as those used in Fig. 4, and G2 = 0.99; C2 = 0.99. Herein, we explore the dynamics of the SI model by simulating a chemotherapeutic mass treatment to infected humans with taeniasis. The treatment is administered to 90% of infected individuals, during a period of 10 years, and considering 90% drug efficacy. Notice that the mean intensities, not only of human taeniasis, but also of human cysticercosis and pig cysticercosis are reduced after the application of the anthelmintic (Fig. 6a). After the intervention ceases the mean intensities return to their pre-control values as has been reported for other helminth infections [25, 26, 76, 77]. In this computer simulation experiment, it turns out that the best strategy would be to treat individuals with human taeniasis since it has the greatest effect in the reduction of mean intensities. However, this result cannot be generalized since other parameter values indicate that the best strategy could be to tackle pig cysticercosis only. It is also shown that the reduction of the mean worm burden of pig cysticercosis and/or human taeniasis improves the health conditions of other hosts. The number of susceptible individuals to human taeniasis (S1) and the number of susceptible individuals to human cysticercosis (S3) decrease linearly and monotonically as a function of age, whilst the number of susceptible animals to porcine cysticercosis (S2) follows an exponential decay (Fig. 6b). The prevalence of human taeniasis infection (J1) increases rapidly with age but its prevalence is reduced while the treatment is applied (Fig. 6c). A similar pattern has been observed in natural communities . The prevalence of infection of pig cysticercosis (J2) increases during the first months of the life of the pigs and eventually declines to zero (Fig. 6c). The prevalence of pig cysticercosis goes to zero before the first year of life of the pigs (Fig. 6c). We emphasize that we are dealing with a Susceptible-Infected model in which a compartment of recovered individuals is not included. The prevalence of infection of human cysticercosis (J3) is maintained at very low values (Fig. 6c) as has been observed in natural communities . The dynamics is shown in Fig. 6d. Note the large excursions of the trajectories of M3 versus M2, M3 versus M1, and the short trajectory of M2 versus M1. In this work, we present a mathematical model of the transmission dynamics of taeniasis-cysticercosis based upon the life cycle of the parasite. This model consists of a set of three differential equations, which are density-dependent equations that describe the flow of the parasite through the definitive and the intermediate host as well as humans infected with cysticercosis. Empirical evidence of the transmission dynamics of taeniasis-cysticercosis is analysed and is used to formulate the present model. The values of the parameters of the model were chosen from the literature and others, such as the degree of aggregation of taenia, were deduced from the fact that most of the time only one or very few tapeworms are present per individual. The stability behaviour of the mean intensities as a function of the transmission coefficients (β1, β2, β3) and of the severities of the density-dependent constraints (α1, α2, α3), were explored by means of bifurcation diagrams. Both the bifurcation analyses and the sensitivity analysis led to feasible ranges of values of these 6 parameters. The model mimics the observed patterns of human taeniasis, pig and human cysticercosis. For example, for a wide range of combination of values of the parameters given in Table 1, the mean intensity of adult worms tends to rapidly stabilize in one parasite per individual host. Therefore, the natural adult worm mortality becomes density independent. The model initially includes two continuous dynamic variables: one for age (a), and one for time (t). A simplification is performed to focus only on the dynamic variable for age and ignoring time. This is equivalent to a time-age advection model and setting the time derivative to zero. We found rich dynamics of the age-dependent model like multiple equilibria, stable and unstable regions, breakpoints and the threshold Ro. However, several improvements can be made to the present model: to include the behaviour over time and age, and to make the state variables, like the mean intensity, prevalence and, susceptibles, random variables. The latter improvements will certainly strengthen or weaken our predictions, particularly those related to the control and/or eventual elimination of the infection. In the context of our model, the reduction of the number of relevant parameters and the explicit incorporation of both acquired immunity and behavioural ecology is completely feasible . One of the hallmarks of the immunology of taeniid cestode infection in their intermediate hosts is that infected hosts are immune to re-infection . This situation is referred to as concomitant immunity, i.e., an infected animal is immune to re-infection, while at the same time parasites from the initial infection remain unaffected. Immunity wanes irrespective of the continued presence of mature metacestodes. One novelty of our model is that it fills gaps of lack of knowledge about the parasites transmission dynamics and the effect of available intervention tools (see also Part 2). Our model also calls for further experimental work in naturally infected pigs to determine what is the initial level of infection that leads to immunity and the duration of immunity. One of the most distinctive features of helminth infections is that they are very stable to climatic or environmental or man-made perturbations [24–26, 28, 29, 33–35, 76, 77]. Most helminth models developed so far deal with control measures such as the application of chemotherapy. The typical result is that after the application of chemotherapy the mean intensity of the helminth parasite returns to their pre-control levels of infection [76, 77]. Our CSE show a case in which chemotherapy against adult worms is more effective than the chemotherapy against the cysticerci. We also obtained cases in which chemotherapy against pig cysticercosis is more effective than the chemotherapy against human teniasisis (not shown). The most significant conclusion to be drawn from the quantitative analysis of the CSE is the following: Chemotherapeutic interventions against pig cysticercosis or against human taeniasis may reduce rapidly and effectively the mean intensity of human taeniasis, pig cysticercosis and human cysticercosis. This effect can be achieved even if the protective efficacy of the drug is of the order of 90% and the coverage rate is also of the order of 90%. This means that health in humans infected either with taenias or cysticerci may be achieved by the application of anthelmintic drugs against pig cysticercosis. From the same life cycle, humans are infected with cysticercosis accidentally. Our results show that if the goal of the program is to reduce the burden of epilepsy associated to neurocysticercosis it may be possible to achieve substantial reductions if chemotherapy is applied to human cysticercosis only. We also observed that the number of susceptible individuals as a function of age to human cysticercosis is always a negative straight line since the value of Ro does not practically contribute to this number except for the term β3H3 in the denominator of Eq. (5). The density-dependent model was extended to a Susceptible-Infected (SI) model which comprises compartmental equations that describe susceptible and infected hosts. This SI model can include vaccination of susceptibles against either human taeniasis and/or against pig cysticercosis. When vaccination strategies against either swine cysticercosis and/or human taeniasis are incorporated to the basic model, new differential equations are needed to identify infected, susceptible, and vaccinated individuals (Part 2). Then, the present model consists of six compartmental equations, one for susceptibles and the other for infected, for each of the three hosts. The resulting mathematical model is then a coupled system of non-linear differential equations, some of which are density-dependent equations and others are compartmental equations. The rationale of the present model is to build a bridge between density-dependent equations with compartmental equations to describe the dynamics of all the hosts that participate in the life cycle of the parasite. This approach can be used for other helminth infections either of direct or indirect transmission (ascaris, schistosomes, hookworms, etcetera). The modification of these equations to include vaccinated individuals is presented in Part II. Then we can assess whether the impact of different vaccination strategies impinge either on the mean intensity and/or the prevalence of the infection and/or the population of susceptible individuals of different hosts. The relative contributions of chemotherapy (and vaccination) can be safely evaluated. Any mathematical model, no matter how complicated, consists of a set of assumptions, from which a set of conclusions are deduced. Provided the model is correct, if we accept its assumptions, we must by logic also accept its conclusions. A mathematical model is a logical machine for converting assumptions into conclusions. The conclusions are already wrapped up into the assumptions, of which they are a logical consequence. This is not to say that the conclusions are obvious. Instead of asking whether we accept the conclusions of the model, we should be asking whether we accept the model’s assumptions. It has been suggested that if a vaccine for cestodes were available and if the immunity changed rapidly, then the endemic steady state may be destabilized, resulting in oscillations in the parasite population . In our CSE, the inspection of the phase spaces does not seem to support that notion. No effective density-dependent constraints were observed for T. hydatigena and T. ovis in the definitive host , except the one in the form of acquired immunity in the intermediate host. Then the combination of administering anti-helminthic drugs to individual suffering from taeniasis and administering the vaccine to pigs against the infection with cysticerci to prevent and even to eliminate this parasite disease is examined in Part II. The recommendations of the International Task Force for Disease Eradication in 1993 placed cysticercosis among 6 potentially eradicable diseases , and more recently The World Health Organization has placed this infection as one of the neglected diseases to overcome by integrated approaches [82, 83]. We hope that the present work may contribute to that target. Finally, we stress that our model contains no arbitrarily adjustable or unmeasurable parameters, it is consistent with both the biology of the life cycle of the parasite and with observed patterns in the field, and it successfully predicts a variety of interesting and unexpected phenomena. We developed the first density-dependent model based upon the actual transmission dynamics of taeniasis-cysticercosis, and one of the first models of helminth parasites that allows the evaluation of the impact of chemotherapeutic interventions upon all hosts involved in the life cycle of the parasite even those that are accidentally infected. From the density-dependent model, we directly derive a susceptible-infected compartmental model with which the impact of vaccination strategies can be evaluated. The whole model represents a significant advance when compared to previous models of taeniasis-cysticercosis. This work is essentially theoretical and involved the participation of all authors. MVJ was financially supported by PAPIIT-IN224015, UNAM, México. NYS is a doctoral student from Programa de Doctorado en Ciencias Biomédicas, Universidad Nacional Autónoma de México (UNAM) and a fellowship recipient from CONACYT (number: 775702). This paper was supported in part by grants from CONACYT 61334 and PAPIIT-UNAM IN213711 to JPL. The values of the parameters of the model are listed in Table 1. All computer programs are available upon request. All programs are in Mathematica, Matlab and Fortran. Conceived the whole work and formulated the model: MVJ. Coded and performed the Computer Simulation Experiments: MVJ, JRB, NYS. Conducted literature reviews for parameter estimates: MVJ, NYS. Sensitivity analysis: MVJ, NYS, JRB. Wrote the paper: MVJ, JPL. Provided comments on the manuscript for intellectual input: JPL, JRB, NYS. All authors read and approved the final manuscript. MVJ is Full Professor and Head of the Theoretical Biology Group; JRB is Academic Technician of the Theoretical Biology Group; NYS is a PhD student of Biomedical Sciences in the Theoretical Biology Group. JPL is Full Professor in the Department of Immunology. WHO. First ever licensed vaccine and anthelmintic against the major cause of epilepsy in the developing world. Geneva: WHO; 2017. http://www.who.int/neglected_diseases/news/First-licensed-vaccine-and-anthelmintic-against-epilepsy/en/.